Getting younger all the time. 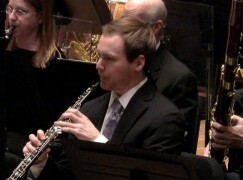 Detroit Symphony has announced Alexander Kinmonth, 21, as its new principal oboe. He’s at Juilliard, expecting to graduate next month. Alex beat 105 candidates to win the seat that Don Baker vacated after 41 years. They’re not “getting younger all the time”… plenty of the great players who are now nearing retirement-age began their careers at Mr. Kinmoth’s age, at a time before multiple post-graduate degrees were expected as a prerequisite for being taken seriously as a musician. That said, a very impressive achievement on his part. Best of luck to him. Hearing today’s Juilliard Orchestra (and Curtis, too) as I do, I’m not surprised when a young musician gets a principal job in a major orchestra.